Your Guide To Overcoming Allergies – Summer should warm us all, body and soul, but many of us sniff and sneeze our way into the season. Here are some suggestions for allergy sufferers. So many of us – and our children – suffer high rates of allergy to everyday substances. These might include foods, pollen, preservatives, chemicals, insect bites, pet hair or saliva, and dust. Our reactions to these allergens are individual, varying from mild and manageable to severe and even life threatening. Whether inconvenient or incapacitating, these responses need to be addressed, and most can be managed naturally. Allergies are reaction to certain substances. Basically, our ever-vigilant immune system responds to toxins, bacteria and viruses with those symptoms we associate with illness. Think mucus build-up, runny-nose and watery or itchy eyes. When these reactions occur in responses substances usually thought harmless – dust, pollen, pet hair, food – that is an allergic response. Our immune system releases antibodies and chemicals called histamines into the bloodstream, creating redness, swelling, itching, mucus and other common signs of allergy. And as the immune system is active from head to toe, this can also include tummy upsets, joint pain, lost sleep and even loss of balance. At a recent stress seminar, one participant told me that on doctor’s orders to his parents, his entire childhood was citrus free. Due to a misdiagnosis of allergy, that poor man had missed out on all that great taste and nutrition. And yes, allergies are notoriously difficult to diagnose. They are best identified through a number of tests, including skin, blood, hair, elimination and provocation. Provocation and blood tests must be carried out under medical supervision. You can see a naturopath for hair testing. However, skin and elimination are the most common and easiest to implement, so I’ll detail those two here. In a Prick Test, a small amount of suspected allergen is placed on the skin, then under the skin’s surface. The skin is monitored for 15-20 minutes for a reaction – usually redness or swelling. Several allergens can be tested at once using this method. Intradermal Skin Tests are similar to a prick test, but the allergen is injected into the skin. This is not used for food allergies, given the risk of severe allergic reaction and the high frequency of false positive results. A Patch Test is where allergens are taped to the skin for 48 hours, checking for reaction half way through and at completion. It’s a good idea to consult a naturopath or allergy specialist for guidance on which approach will be best for you. Elimination testing is something you can do yourself, and if you’re troubled by allergic reactions, I recommend you get started right now. This is especially the case with food allergies. Although many people have food intolerances, food allergies are much less common. In fact, current US research has found they affect only 1 percent of the population. In a true food allergy, the immune system produces antibodies and histamine in response to the specific food. So, rather than focusing on true food allergies, which can cause anaphylaxis or toxic shock, I’ll concentrate on everybody food sensitivity, intolerance, or lesser allergies. A Fixed Allergy occurs after consuming a particular food such as shellfish or strawberries. It results in a predictable reaction, usually within 24 hours. A Non-Fixed Allergy comes in two types. The first is addictive allergy, which is a craving to prevent withdrawal from a food or substances like tobacco, alcohol, wheat, sugar, or caffeine The second is cyclic or masked allergy, which develops through repetitive eating of the same substance. Symptoms in this case may not appear for 3-5 days, and as they are ongoing, they are assumed to be ‘normal’ or not food-related. Avoidance for 4-6 months can see these symptoms disappear until the food is consumed again. The good news is that a sensitivity or allergic response may be overcome entirely by such a break and the body may later accept a gradual reintroduction with response. In weeks 1-3, eat only elimination diet food, using this to identify food sensitivity. Diary everything you consume for one week, along with any reactions, especially to foods on the common food allergen list. Then, for two weeks, discontinue all foods on the allergen list and any foods you reacted to. In week four, introduce food and drinks back into your diet at a rate of one food daily. If there is no reaction, add the next from your list of removed food. Start with fresh fruit, vegies and bottles juices, then processed foods, refined carbohydrates including cakes and biscuits, ice cream, then alcohol. Keep a diary and record any reactions. Gluten (wheat, oats, rye and barley), corn, soy, sugar, yeast, chicken, beef, eggs, fish, shellfish milk, yeast, oranges (often all of the citrus group), potatoes, bananas, tomatoes, apples, iceberg lettuce, carrots, peas, green beans, food additives, peanuts, tea, tobacco, alcohol, coffee and chocolate. Organic meat – turkey, rabbit and all game. Fish – except smoked fish or shellfish. Organic fresh vegetables – except potato, eggplant, tomato, onion, corn, iceberg lettuce. Organic fresh fruit – except citrus, bottled fruit juice, raw apples, strawberries. Organic oils – flax, evening primrose, olive, safflower, almond, or grape seed. Organic grains – millet, buckwheat, rice except glutinous rice. Sweeteners – raw or manuka honey are best. Natural flavourings – herbs, spices (except paprika), carob and sea salt. Drinks – bottled water, herbal tea, chicory coffee, fresh vegie and fruit juices, except those listed above. What if I find a food sensitivity? You may notice a reaction when a food is reintroduced, and those symptoms may be dramatic. Help clear the allergy by drinking a teaspoon of baking soda dissolved in 1 litre of water, then eliminate that substance from your diet for at least six months. If you experience shortness of breath, extreme skin rash, swollen throat, lips, or tongue, stop eating and see a doctor as soon as possible. Your next reaction to that substance is likely to be more severe and possibly life threatening. Avoid outdoor activity and keep your windows closed from 5-10am, when pollen production peaks. Pollen collects on hair and clothing, so change your clothes and shower after being outside. Wash your hands frequently, especially before touching your eyes. Don’t hang laundry outdoors, as pollen will settle on it. For dust and pet allergies, keep pets off the beds, use low- or chemical-free cleaners, and consider installing a HEPA air filter. Regularly turn and air all seats, couches and mattresses, and consider using mite-proof covers. Reduce or eliminate any foods to which you are sensitive. These may increase your allergic reactions. 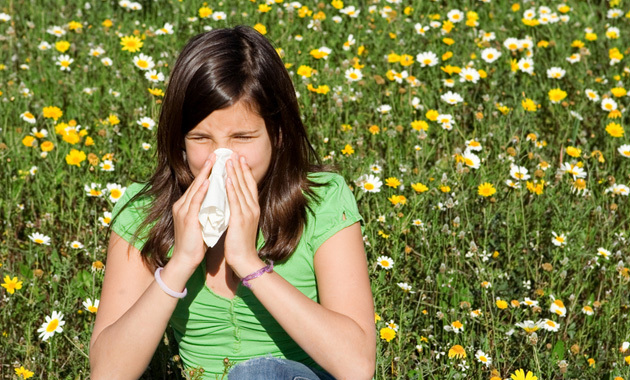 To treat hayfever successfully, avoid allergens as much as possible and take herbs every day to be effective. To start with, you may have to wait 4-7 days for the herbs to reduce their hayfever reaction and its symptoms. Resveratrol and quercitin – Aid stabilisation of cell membranes and hinder the release of allergy chemicals into the body. Take 125mg daily. Perilla – Japanese studies have showed that over a 2-3 month period, perilla improves allergic symptoms, including seasonal pollinosis, allergic rhinitis, recurrent sneezing, watery and itchy nose and eyes, and facial itching. Take 150-200mg of the extract daily for two weeks, then 100 mg daily. Boswellia – An anti-inflammatory that effectively shrinks inflamed tissues, and inhibits leukotriene formation, which is involved with inflammatory processes associated with the sinus. Take 200mg boswellia gum extract (Boswellia serrata – standardised to 70 percent boswellic acid) three times daily. Eyebright – For eye irritation, redness, nasal catarrh and watery flow, sinusitis, chronic sneezing, hayfever, middle ear disturbance and sore throats. Take 1.5g daily. Skullcap (Scutellaria baicalensis) – Restricts inflammation. For all allergic reactions, asthma sinus, eczema ad hayfever. Take 400mg three times daily. Flaxseed oil (2 Tbsp daily), evening primrose oil (3g daily), and colostrum (4g daily) – May help reduce leaky gut syndrome and the inflammation associated with allergies. Antioxidants – Help heal the digestive system, prevent leaky gut syndrome, and deal with toxic and free radical overload. They include antioxidant formulae (full spectrum); resveratrol; acai berry; turmeric; green tea; beta-carotene; Vitamins E, A and C; proanthocyanidins; flavonoids and adjunctive minerals (zinc, selenium, manganese, iron). Acidophilus and bifidus – For digestive health. Take 1 billion of acidophilus and bifidus species to repopulate your digestive system. Vitamin C (500mg-1g daily), calcium (1-1.5g daily) and magnesium (450mg daily) – Build tolerance to allergies. Celloids or tissue salts – Silica, calc flour, and mag phos tissue salts aid healing of the digestive system and reduce susceptibility to allergies. Take as directed. Support the liver – Dandelion (1g dried root) and milk thistle (2g seed) enhance bile flow and to help detoxify the liver. Adrenal glands – Take schisandra (500mg-3g daily) and withania (500mg-1.5g daily) for 3-6 months. Increase good digestive juices – A few drops of bitters before meals aids digestion and mineral absorption; or try 50ml aloe juice. Homeopathic remedies – may be developed or matched against specific allergy characteristics, See an experienced homeopath for details.